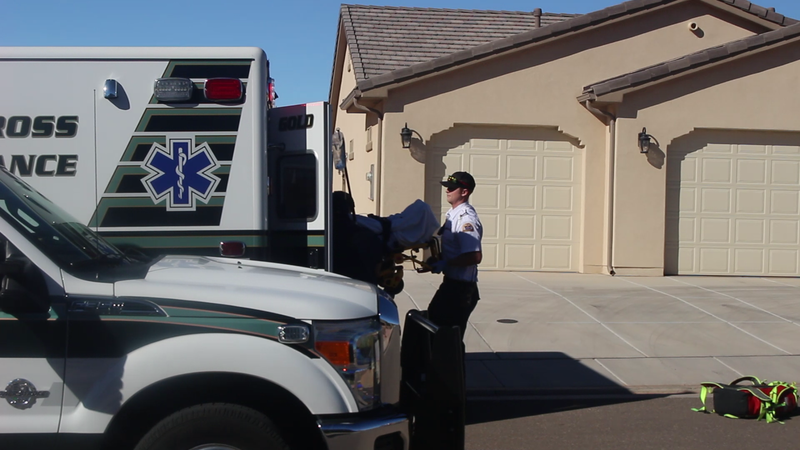 ST. GEORGE – A teen was taken to the hospital Monday afternoon after accidentally shooting himself. St. George Police and other first responders were sent to a home on Rome Drive in the Hidden Valley area just before 3 p.m. The situation involved the “negligent discharge” of a deer rifle that put a bullet in the 17-year-old boy’s leg, St. George Police Sgt. Tyler Cowan said. No foul play is suspected as the boy’s story about the rifle misfiring largely matches what police found at the scene, Cowan said, adding he wasn’t able to go into further detail surrounding the particulars of the incident. St. George Police Lt. Johnny Helper later confirmed the incident is being investigated as an accident. The boy was awake and alert when taken out of his home on a stretcher and loaded into the back of a waiting Gold Cross Ambulance that took him to Dixie Regional Medical Center for surgery. The injury was reported to not be life-threatening. The boy had recently returned from deer hunting, Cowan said. A deer rifle? …that’s pretty vague.